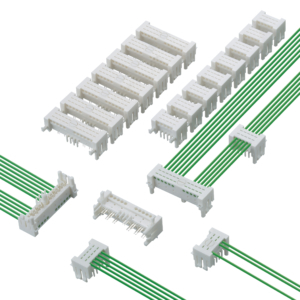 For cable-to-board connections with flat cables, where space is at a premium. 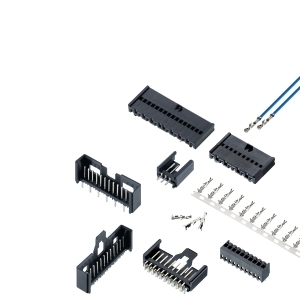 Plugs and solder-in connectors in insulation displacement technology, tab headers for THT and SMT soldering. For signal and low load currents up to 1.2 A, pitch 1.27 mm (.050"). No product found with this configuration. Direct mating with SKEDD technology, for cable-to-board connections in insulation displacement technology. Keying avoids mismating. For signal and low load currents up to 4 A, pitch 2.5 mm (.098"). 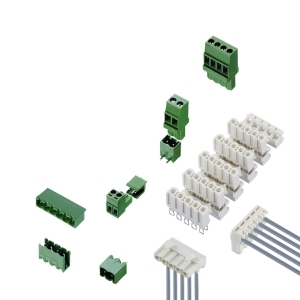 For cable-to-board and board-to-board connections in automotive and beyond. 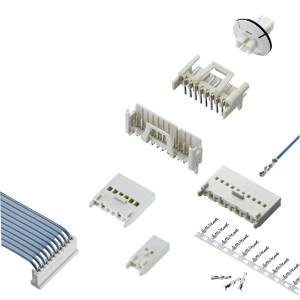 Solderless press-fit connections as per IEC 60352-5. For cable-to-board and board-to-board connections. Easy harnessing of single leads and flat cables with crimp technology. Especially suitable for low and middle-volume production. For signal and low load currents up to 5 A. Pitch 2.50 mm (.098"). 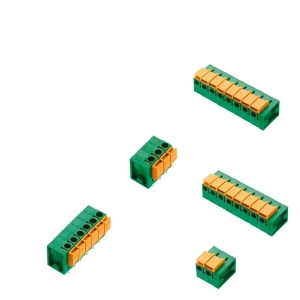 For cable-to-board and board-to-board connections. Easy harnessing of single leads and flat cables with insulation displacement and crimp technology. Especially suitable for middle and high-volume production. For signal and low load currents up to 3 A, pitch 2.5 mm (.098"). For direkt connection of two contact pins, i.e. as a jumper for alternative circuitry. 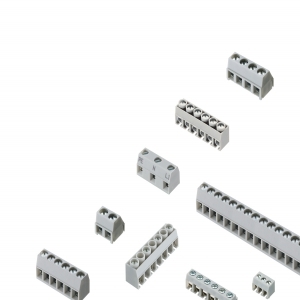 Shorting links are suitable for pin headers with pitch 2.5 mm and 2.54 mm (.098" and .100"). 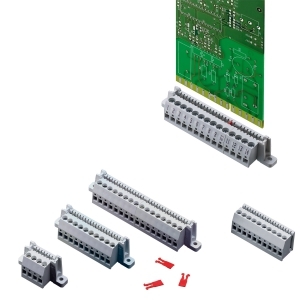 For signal and load currents up to 5 A.
Sockets boards for insert cards, with solder pins for board-to-board or solder eyes for cable-to-board connections. With accessory keying inserts, mounting and guide flanges. 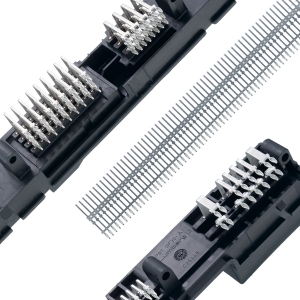 For signal and load currents up to 5 A, pitch 2.5 mm, 2.54 mm, 5.0 mm and 5.08 mm (.098", .100", .197", .200"). 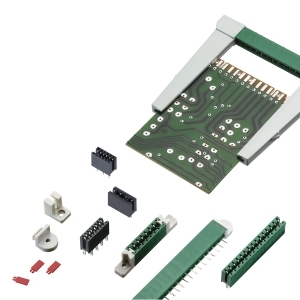 Sockets boards for insert cards, with screw clamps for cable-to-board connections. With accessory keying inserts, mounting and guide flanges. For signal and load currents up to 5 A, pitch 5.0 mm (.197"). Service-friendly: quick and easy connecting and detaching of conductors. For signal and load currents up to 10 A, pitch 5.08 mm (.200"). For all cable-to-board connections relevant to maintainance. Lead sections up to 4.0 mm². 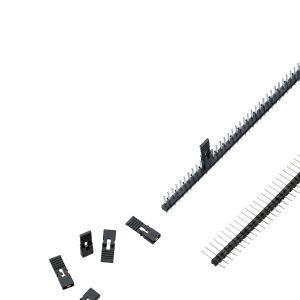 For signal and load currents up to 15 A, pitch 3.5 mm, 5.0 mm and 10.0 mm (.138", .197" and .394"). Space-saving solution of pluggable screw termination, no mismating, with locking. Lead sections up to 4.0 mm². For signal and load currents up to 10 A, pitch 5.0 mm (.197"). 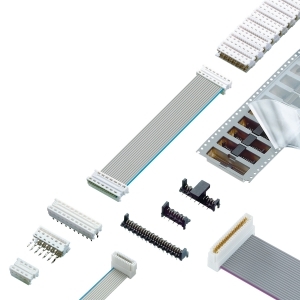 Connectors with screw terminals and insulation displacement termination (IDT) for automated harnessing, many versions. Compatible mating with many products in the market. 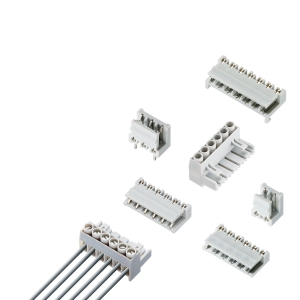 For signal and load currents up to 16 A, pitch 5.08 mm (.200").